Posted on 11, September 2018 by EuropaWire PR Editors | This entry was posted in Industrial, Technology, Transportation & Logistics, United Kingdom and tagged Andreas Seth, marine, Per Nahnfeldt, pods, propulsion system, Rolls-Royce. Bookmark the permalink. LONDON, 11-Sep-2018 — /EuropaWire/ — Rolls-Royce has today unveiled ELegance – a completely new podded propulsion system designed to meet market demand for smaller, more compact units. The ELegance pods – one with an open propeller, the other ducted – complement and complete the company’s existing portfolio of mechanical and electric propulsion systems. 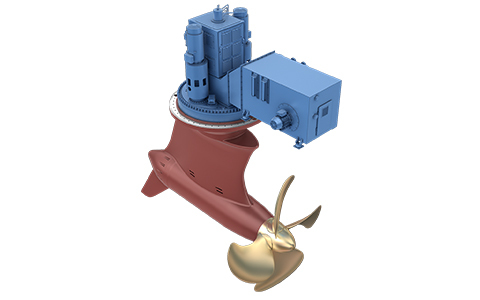 The use of permanent magnet (PM) motors in podded propulsion provides a high motor efficiency over all speed ranges. Their use also results in a pod that optimises the trade-off between electric, mechanical and hydrodynamic efficiency. “Both pushing and pulling pods have been designed with several layers of redundancy on critical and hard-to-reach components, with service points positioned for easy access,” said Nahnfeldt. Maintenance is optimised by way of fewer moving parts within the below-the-waterline housing and the only components that require dry-docking service are the pod’s bearings and seals. These however have a life expectancy of ten years or more before they need replacing. “This reduced maintenance requirement correlates directly to low life-cycle costs,” said Nahnfeldt, adding that with a focus on environmental safe operation, the robust sealing solution that has been selected has no oil-to-sea interfaces. Should system oil leak at all, it is fed into a dedicated sump connected to the ship’s bilge system.